Tales from a tribble: Andre and Andres On The Same Stage - Can It Get Any Better Than This? Andre and Andres On The Same Stage - Can It Get Any Better Than This? Wow, Andre and Andres on the stage together - can it get any better than this? This blog has featured many times our exciting new world class director, Andres Orosco-Estrada. Please check out if you haven't already: "Welcome Maestro Andres Orosco-Estrada to Houston". It will be such a pleasure to welcome pianist deluxe Andre Watts to Houston's Jones Hall. This from the All Music Andre Watts Biography web site: " Born on a United States Army base in Nuremberg, part of the U.S. Occupied Zone of Germany in the years following World War II, he [Andre Watts] was the son of an American soldier who had married a Hungarian woman. His mother gave André his first piano lessons." "Watts was 14 when he made his official Philadelphia Orchestra debut, in César Franck's Symphonic Variations. His real breakthrough came two years later when Leonard Bernstein asked him to appear on a New York Philharmonic Young People's Concert that was broadcast nationwide." "After making his Carnegie Hall solo debut in New York at the age of 20, Watts celebrated his 21st birthday by playing Brahms' Piano Concerto No. 2 with the Berlin Philharmonic Orchestra. He returned to Nuremberg for a recital in 1970 and was hailed as a returning native son." "Watts specializes in the standard repertory from Beethoven through Rachmaninov, often performing Mozart and Scarlatti as well." Houston is truly blessed to have Andre Watts come here and perform one of the most beautiful piano concertos in the repertoire, Rachmaninoff's piano concerto #2. This piece is one of my favorites and I know it is one of Mrs. B's favorites as I am sure she will demonstrate by humming along the ultra beautiful main theme of the third movement, as it is being played. The concert program for tonight will consist of a World Premier commissioned by the Houston Symphony from Gabriela Lena Frank [a contemporary American pianist and composer]; Rachmaninoff's Piano Concerto #2 in C-minor; and Richard Strauss symphonic tone poem Ein Heldenleben "A Hero's Life". Enjoy these two videos, the first featuring Andre Watts at the piano performing the Italian Baroque/Classical composer, Domenico Scarlatti's keyboard Sonatas in D-minor and A-Major. Then in the second video enjoy the third movement, Allegro Scherzando, of Serge Rachmaninoff's beloved melodic second piano concerto. 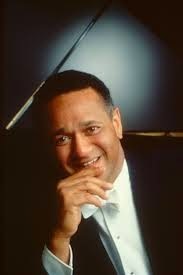 You will understand why we are looking so forward to tonight's concert after watching the great Andre Watts at the piano and after hearing one of the pieces we will be hearing tonight. On the second video, I already know ahead of time my wife will be humming [I hope softly :-)] at the 2:00 mark and especially at 2:34 when the pianist Lang Lang takes over the main theme from the orchestra in the second video. See if you start humming too! Please turn up the volume and play full screen and enjoy both videos. UPDATE: The fetching Mrs. B and I loved the concert at Jones Hall last night. Bravos! go to every member of the Houston Symphony Orchestra; to our dynamic new conductor Maestro Andres Orosco-Estrada; to awesome pianist and wonderful gentleman Andre Watts, and to the personable American born [with a Peruvian mom and Jewish Lithuanian father] young composer Gabreila Lena Frank. I can say personable because Gabriela was at the prelude-pre-concert talk before the concert started. What a nice woman and what a great composition making its World Premiere. We loved not only Gabriela's piece but of course, the luscious Rachmaninoff Piano Concerto #2, where Andre Watts was magnificent as the soloist and also loved Andres Orosco-Estrada's equisite conducting of the pensive, heroic tone poem by Strauss, "A Hero's Life". I told my wife I have never seen such rapport between conductor and soloist in a concerto like I saw between Andres Orosco-Estrada and Andre Watts. There wasn't the occasional glance between the two, but a constant communication between those two giants of music. Enjoy this special romantic and beautiful evening! Andre and Rachmanioff!!! You lucky dog! Enjoy. Andre Watts is the best! Really enjoyed the Andrė Watts clip. Thanks!